After months of hard work, we are excited to release Carbon LDP™ version 5! New support for enterprise-class databases and clustering, among other features, make this our most significant release to date and the first to be relevant for companies of all sizes. Our new release is now available in two license tiers. The Standard edition is still free, provides all features using a local file system database, and is suitable for development and small-business apps. The new Enterprise edition now provides support for the Stardog Enterprise Knowledge Graph Platform and external RDF4J repositories such as Ontotext’s GraphDB™. When using an external database you can now configure a Carbon LDP cluster to scale. A cluster is one or more Carbon LDP server nodes behind a load balancer. Nodes can be added or removed from the cluster without affecting availability. It is now possible to register listeners that will be triggered when changes to data occur such as when documents are created, modified, and deleted. Event listeners can be registered over specific documents, children, specific branches or the whole database. This enables you to build real-time and notification-based applications or to coordinate cache population and eviction, for example. A powerful new query system makes it easier to find and retrieve data using the document object model (queries return Carbon documents with their typical behavior). You can query without having to master the SPARQL query language while still having SPARQL powers like filtering, property paths, and ordering. You can now retrieve multiple documents at the same time, and even nested documents, so that your applications need fewer REST API calls. For the lightest possible payloads, you can retrieve only the properties you care about and you can protect your application from unexpected value formats in the data by retrieving only the values your app is capable of handling. What’s more, Carbon LDP optimizes queries so that you don’t have to. Carbon-specific properties will never conflict with properties in your data since now all Carbon properties have been namespaced in the SDK. Carbon-specific properties are now prefixed in the SDK with the $ symbol (e.g. document.$id ). 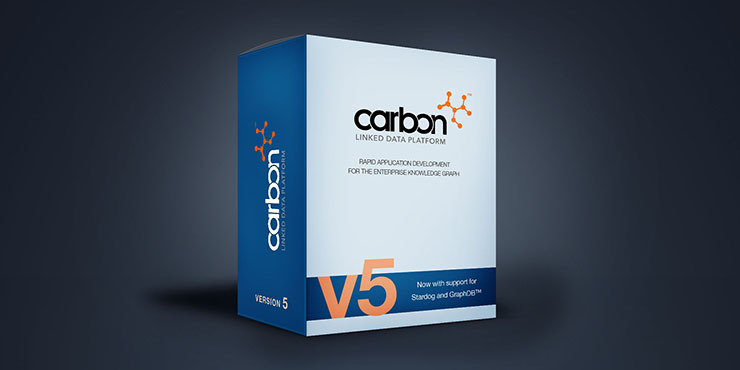 In addition to these new features, a host of additional improvements and optimizations have been made – making Carbon LDP v5 more powerful and performant than ever before. Carbon LDP is the system we’ve always wanted, so we built it. We can’t wait to help you discover what amazing new solutions you can build. Learn how to obtain and use the free Standard edition right away with our Quick start guide and dive deeper with the product documentation.